This week has been a flurry of sorting and purging to move my studio and renewed work on my Fancy Fish Tutorial. Our Destash Sale last weekend was a bust in terms of finding new homes for our old inventory. Turns out it was openning day for ticket sales for the Mariners and there was a Sounder's game, so the few people who did try to come couldn't find parking. Ouch! While sorting through tubs of fabric, buttons, lace and who knows what, I also came up with a better way to organize my Fancy Fish Tutorial and ideas for several additions. Luckily, the kind souls who'd purchased my tutorial were willing to wait a couple of days for delivery. So it was back to the the drawing board and several more rounds of edits. I finished it up Tuesday evening just before bedtime. And sighed with relief. The latest edition topped out at twenty-four book style pages. This is my most detailed tutorial yet and the diagrams are the prettiest I've ever created. I showed my newly refinished tutorial to my husband (who had been out of town for the past week) and my best friend yesterday and got a tongue lashing from both for underpricing my tutorials. Chatting via email with one of the people who'd purchased my tutorial, she agreed that I'd underpriced it - especially since my license allows the purchaser to sell items they make with my pattern at local craft shows and galleries. Bowing to their wisdom, I raised my price a little on Etsy. However that didn't seem fair to my blog readers who knew the old price. 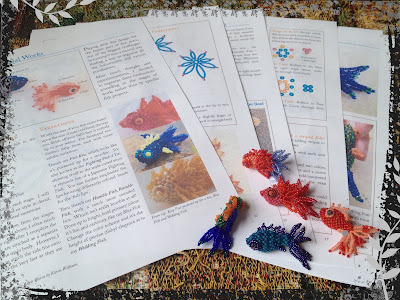 So, through the end of the month, you can still purchase my Fancy Fish Beadwoven Friends PDF tutorial for the old price by using the coupon code BLOGFRIENDs, which will take $3 off at checkout. This coupon is only good for my Fancy Fish tutorial, please! I hope you sell lots of them. They are pretty and your tutorials are very well executed. Yes! Evil Temptress me! :) I like the sound of that - have to tell my husband. But I know what you mean; Rosetta Stone almost tempted me to buy a Russian language course yesterday with one of their sales, something I Definitely don't have time for! At least these little fish are quick to make in comparison. Great fish! I’m part of the bead soup party. Looking forward to the reveals. I'm now following you. I have a new blog. Please consider following my jewelry blog. Thanks.